Deborah Brown - Free at Last, Free at Last! Each lesson includes an overview, a purpose, the objectives, resource material, activities as well as expectations. 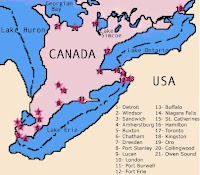 Expectations are from the Ontario curriculum for social studies, history and geography, however these concepts could also be covered in other curriculums. Resource material includes all the texts that students will need to read. The page layout is better suited for Web browser than paper. Activities lack many pictures which are necessary with this age group. The information presented is very interesting and very appropriate for these students. November 1, 2011 at 11:28 p.m.